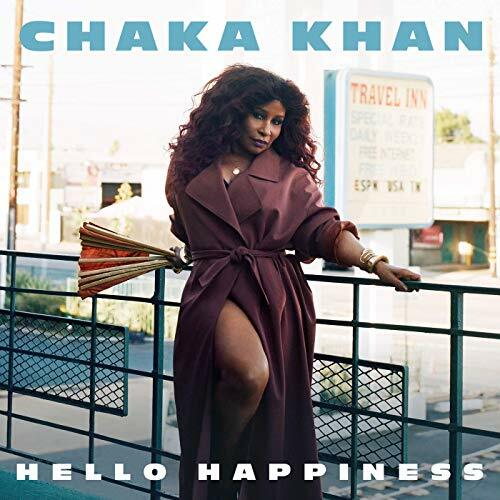 Chaka Khan | Hello Happiness - TheUrbanMusicScene.com | Music Reviews! While there will always be room at the table for vintage Chaka Khan (with & without Rufus), will her new offering HELLO HAPPINESS be invited to the cookout? As an homage to dance music from 70s disco to 90s house, the project jams best when maintaining that focus as on the initial single “Like Sugar” and the current single, the title track. “Like A Lady” goes just as hard with its catchy brand of funk and sing-a-long chorus. It’s one of the few tracks where Chaka’s legendary voice sounds like the star of the show and isn’t covered in a bunch of production. The results are mixed however when the project slithers into other territories. “Isn’t That Enough” teases you as if it’s going to develop into a nice piece of reggae/pop, and then it doesn’t. “Don’t Cha Know” is weighed down by so much unnecessary production it sounds like it could’ve been on her noisy (and also over produced) album 1986’s DESTINY. “Too Hot” brings some bluesy heat and allows for a more straightaway vocal from Khan, but it also becomes the victim of too much production near the final third of the song. While HELLO HAPPINESS certainly brings some feel good vibes and Khan’s voice is as vibrant and electric as ever, production by Switch (aka Major Lazer founder David Taylor) nearly steals its joy. And at only six tracks (“Ladylike” is an acoustic version of “Like A Lady”), the project feels disappointingly brief. So sure HELLO HAPPINESS can come to the cookout, but it must bring 1989’s LIFE IS A DANCE and 1992’s THE WOMAN I AM as examples of what it could’ve been if it wasn’t trying so hard to be cutting edge. Favorite tracks: “Like A Lady/LadyLike”, “Hello Happiness”. Least favorite track: “Don’t Cha Know”. Rating: 3 out of 5 stars, because of its brevity and heavy production.